What is the Best Way to Get Rid of Mold in My Bathroom? Mold is one of the most common and most persistent enemies of any household. It is an uninvited, unwelcome guest, looking for damp places to spread its spores. Once it has infected your home, you will need to call mold remediation San Diego professionals to get rid of it. However, before you find yourself searching for the best way to get rid of mold, you can put some effort into mold prevention. Nobody wants to think about mold, but thinking ahead can save you a major headache down the line. 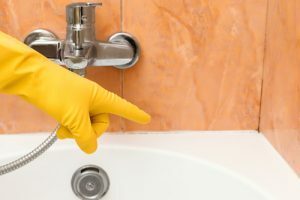 Getting rid of mold in your bathroom is best accomplished by leaving the job to the pros and ensuring the perfect results, but that doesn’t mean you don’t have an important role to play in operation mold elimination! Mold is not picky, so it can appear anywhere in the house as long as there’s an excess of moisture and water, even inside your drywall. This happens in basements, kitchens and especially bathrooms. A bathroom, used on daily basis, has countless nooks and crannies where mold spores could nest, landing you in trouble. The condensation and warm temperature enable mold to thrive, so you have to do your best to counter their effects. Mold prevention is a proven way to spare yourself the trouble of dealing with mold in the first place, not to mention its potential health hazards. In case it’s too late for this, the best way to get rid of mold is to let expert mold removal service providers work their magic. But here are some things you can do yourself. Every time you shower or take a bath, condensation gathers in your bathroom. After you’re done, remember to always open the window to enable the flow of air. If there is no window in your bathroom, consider installing an exhaust fan to aid you in your fight against mold. Natural light will decrease the chance of it appearing, as will will scrubbing the walls and tiles with a squeegee to remove moisture. Mold likes edges and corners – a common feature of most bathrooms. Sometimes, it can lodge itself deep inside a crevice, meaning you need to re-caulk that particular crevice to prevent mold from spreading. The same applies to silicone, a potential breeding ground for mold, especially if the wrong type of silicone was used to begin with. Use the ones that contain a special fungicide. Regular cleaning is not only beneficial for your health, but also represents the best way to get rid of mold before it even appears. Put some time and effort into it after every shower or bath. A mold-free bathroom will make it worth your while. If you haven’t been able to prevent mold from appearing in your house, there is still a way to get rid of it for good. At KIC Restoration, we use the most efficient mold removal methods and we won’t stop until mold has been completely eradicated. We are the best way to get rid of mold, so call us today and leave it to us!